AUCTION DATE: THURSDAY SEPTEMBER 24, 2015 @ 11:00 A.M.
Iron Crafter mdl. HTS-48 3/8” x 48” Hydraulic Power Shear s/n 81S048 w/ Hydraulic Clamp-Downs, Manual Back Gauge, Will Cut up to ½” Mild Steel. Iron Crafter mdl. PBAE-48-50 50 Ton x 48” Hydraulic Press Brake s/n 81H049 w/ Manual Back Gauge, 56” Bed Length, 61 ½” Ram Length, 6” Throat, 52” Between Uprights, 4-Die Die Base. Scotchman mdl. 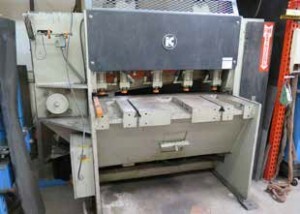 314 Dvorak Hydraulic Ironworker s/n 5002 w/ Punch, 14” Flat Shear, 3” x 3” Angle Shear, 4” x 4” Coping Notcher Attachment. Scotchman mdl. 207 Hydraulic Ironworker s/n 521J71881 w/ Punch, 7” Flat Shear, 2” x 2” Angle Shear. Custom Hydraulic H-Frame Style 24” Press Brake. Dake 50 Ton Sliding Ram Hydraulic H-Frame Press s/n 145246. 24” Hand Roll w/ 3” Rolls. Cincinnati “Hydra-Shift” 17” x 48” Tray-Top Lathe s/n 1W3E5R-34 w/ 37-1470 RPM, Taper Attachment, Inch Threading, Tailstock, Steady Rest, KDK Tool Post, 10” 3-Jaw Chuck. Sharp / Ta Shing 15” x 28” Geared Head Gap Bed Lathe s/n W701116 w/ 83-1800 RPM, Inch Threading, Tailstock, Steady Rest, KDK Tool Post, 8” 3-Jaw Chuck. Shenwai mdl. SW-350B 12” x 24” Geared Head Gap Bed Lathe w/ 80-1250 RPM, Inch/mm Threading, Tailstock, KDK Tool Post, 5C Collet Closer, 6” 3-Jaw Chuck. AcraMill Vertical Mill s/n 20724 w/ Anilam DRO, 75-4200 Dial RPM, Chrome Ways, Power Feed, 10” x 50” Table. Bridgeport Vertical Mill s/n 167172 w/ Mitutoyo DRO, 1Hp Motor, Van Norman Universal Horizontal Mill s/n 9301 w/ 9” x 37 ½” Table. Boyar Schultz mdl. 1A-618 6” x 18” Automatic Surface Grinder s/n CH2391-1A w/ Magnetic Chuck. Deckel mdl. SOn Single Lip Tool Grinder s/n 80331 w/ Collets. Darex Tool and Cutter Grinder. Darex Precision Drill Sharpener w/ Large Diameter Upgrade. DoAll mdl. ML 16” Vertical Band Saw w/ Blade Welder, 24” x 4” Table. Wells 9” Horizontal Band Saw. Emerson 7” Horizontal Band Saw. Cincinnati Royal 6-Speed Heavy Duty Pedestal Drill Press. LS mdl. KRD-420 Bench Model Drill Press. SpeedAire 5Hp Vertical Air Compressor w/ 60 Gallon Tank. Ingersoll Rand Series 4000 5Hp Vertical Air Compressor w/ 60 Gallon Tank. Krome-King Chrome Plating and Stripping Tank w/ Acces. (4) Thermolyne and Jelenco Electric Furnaces. Top-Line Bench Model Media Tumbler. Miller Syncrowave 351 CC-AC/DC Arc Welding Power Source s/n KD517131 w/ Upgraded Board Packages, Preflow and Spot Timers, Start Control, Crater Fill, Arc/Balance Control, Background Amperage, HF/Continuous. Miller Syncrowave 300(S) AC/DC Gas Tungsten or Shielded Arc Welding Power Source s/n JF843240 w/ Upgraded Board Packages, Miller Syncrowave Programmer SP-2, Spot and Preflow Timers, AC Balance, Post-Flow Timer, Crater Fill, Cooler. Miller 330A/BP CC-AC/DC Arc Welding Power Source s/n HH09869 w/ Tweco TW900 Cooler.